Hey all! I wanted to share with you the instructions I gave my kids for the after school art class I teach. 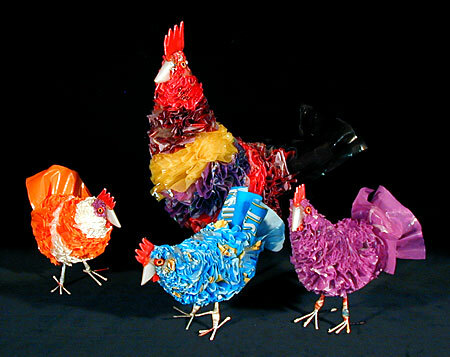 The basic idea is melting old plastic shopping bags into a composite plastic which you can then create a waterproof fused plastic bag! The process is fun and a great way to put all of those old shopping bags to use instead of throwing them into the landfill. I challenge you to make this project your own and use the instructions from this class as a guideline to make with this fused material whatever your little creative heart can dream up! 1. Lay down flat 3 – 4 bags, or rather 6-8 layers of plastic (more or less plastic will result in either holes, or the plastic not properly fusing). 3. Between two pieces of parchment paper, place your layers of plastic on the ironing board and very slowly move the iron across the plastic perhaps for 20 seconds or so. Each person’s iron heats to a different temperature, but to give you an idea, I put mine on the Rayon setting. You want to heat the plastic enough for it to entirely melt together, but not burn holes or become too textured. There is a very fine line, so I would suggest a few trial runs until you understand the material the best you can. Iron the top for a while, and then flip the plastic over and iron the bottom (Of course, always with the parchment between the plastic and the iron. We don’t want to be ruining our irons!!). When you are finished it should very much be one smooth(ish) piece of plastic! If you have gotten this far…Hooray! because this takes some skill and patience! 4. 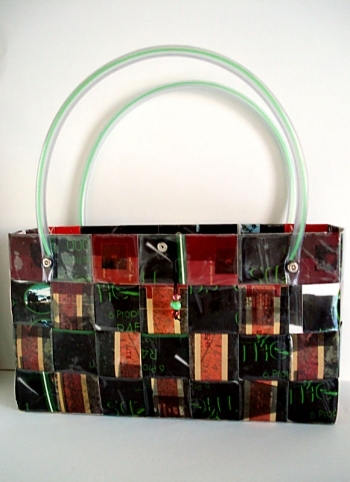 Draw up a pattern for the type of bag you would like to make out of your plastic. For ease, the kids and I created 8″ x 12″ pouches with a Velcro closure, but I am sure our readers have much better sewing skills than fifth graders, so I encourage you to create a pouch with a zipper or snap closure. Cut the pattern out of your plastic, sew the sides, add the closures, and you are ready to walk off in style and with a happy heart knowing you have helped the earth! If you have any questions or comments, please let me know. And if you take a picture of your finished project, please send it to me at diy@modcloth.com or post them in a comment – I’d love to see your projects and share them with other blog readers! This is a cool project, and easy! Obviously, the kids love it too! They’re too cute! Such an awesome idea! I’m definitely going to try this when I have more time. I AM SO GLAD I FOUND THIS – HAVE HEARD ABOUT IT AND HAVE BEEN LOOKING FOR INSTRUCTIONS – CAN’T WAIT TO SHOW YOU MY FINISHED PROJECT – I HAVE A GREAT IDEA! Wow! that is so cool, can’t wait to make mine! Thanks for sharing this! For anyone who is interested in recycle art, I just want to say that we do this kind of thing a lot in South Africa. If you drive down the street in Cape Town you’ll see people selling all kinds of goods made out of old plastic bags, tin cans and wire. Often a percentage of the proceeds go to a charity group.